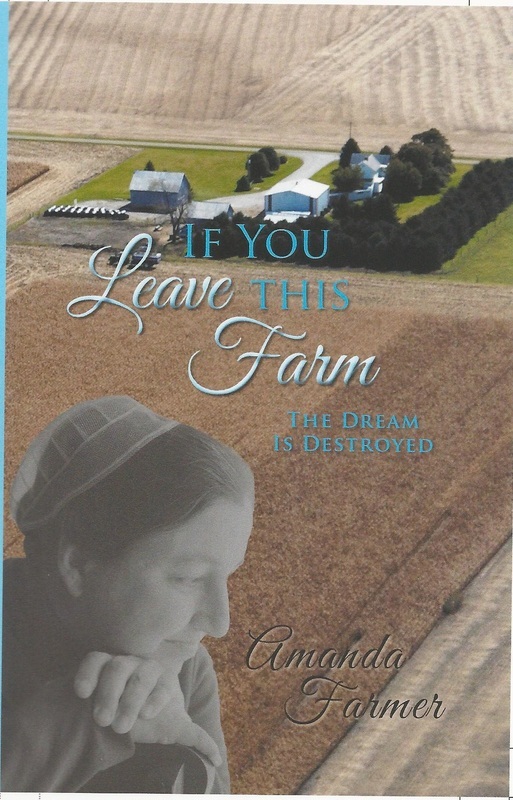 If You Leave This Farm - "If You Leave This Farm..." & "No Longer A Child of Promise"
As a teenage Mennonite girl, the author, Amanda lives with her close knit family in south central Pennsylvania. Life revolves around hard work, faith, and commitment to the family. Amanda does not question the daily routine of hard work that is life as this is all she has ever known. Her father begins to talk about buying a farm “out west,” a farm with lots of land all in one block. Not only will the family farm there together but the parents hope is to begin a new Mennonite community there. To a fifteen year old, this move begins as a truly exciting adventure. But the first crop year in Minnesota is a failure of epic proportions and the patriarch of the family makes the decision alone to expand the new dairy in an attempt to recoup the losses through the cows. “Saving the farm” and “making a go of it” become the primary emphasis of all decisions. Disillusionment begins to set in as life becomes a never ending process of hard work, little recreation, and no control over the course of the future. The book chronicles the years of struggle by Amanda and also her younger brother, Joseph, to escape the suffocating and controlling behavior of their father. Intermingled into the struggle on the farm is the struggle to become an accepted member of the Mennonite community in Minnesota. The change in Daddy’s behavior and attitude during the first couple of years in Minnesota begins to alienate him and his family from others of the same faith. Amanda goes through a mixture of emotions as she wrestles with the shame of her family’s standing in the Mennonite community and the crushing weight of constant submission to her father’s misguided use of his God given authority. September 5, orientation day for the nursing program, arrives with low-hanging clouds and pattering rain. The atmosphere in our household is just as dark and stormy. I have never before “abandoned” my duties during the fall to take classes. I feel guilty that I am letting my father down and, at the same time, I am determined to build a different life for myself. The orientation session is from one to four o’clock in the afternoon. During the session, the expectations of the program are laid out for us. My anxiety grows as I listen to the number of nursing-care plans, professional papers, and projects that will be required. I am feeling overwhelmed by the time I hurry to my car for the drive home. This is never going to work! The clock is pushing five when I step inside the house and hurry up the stairs to change clothes. The milker pump is sending out its deep throated roar from the barn. At least someone has started the chores. I glance at Pappy’s face as I step down into the parlor. His jaw is set, and the facial lines are tight, but he does not say anything as I take his place. I read his body language as disapproval of me, and I feel the familiar churning in my stomach. Hurry! Hurry! Hurry! This is the further stepped-up state of my life. We have four hours of class every afternoon except Tuesday. Then on Friday, because it is our main clinical day, class starts at eight o’clock in the morning. I am sure I smell like the barn most days, as I barely have time to change clothes before I leave home. I have already gotten comments about my dirty fingernails and the need to come to clinical with them clean. I am not sure how one can milk cows twice a day and still have clean fingernails. I do love learning about nursing and interacting with the other students. Just yesterday, we were practicing how to interview patients. It was hilarious. I don’t think I have laughed that hard in a long time. Studying is a struggle, though, as every time I sit down, I drift off to sleep. And in between classes and on my days off, I need to work the care of the cows and calves into my schedule. The fall has been rainy. The harvest is behind schedule and slow. Corn harvest does not even get underway until late October, making for irritable harvesters. My job, besides taking care of the cattle, is watching the corn dryer. This is something I can do while I milk, bed hutches, do bookwork, move cows around, and take care of new babies. Occasionally, I haul a load of corn, but most of the fieldwork is left to the menfolk. November 7 dawns cool but sunny. Today is my first real nursing clinical, but I don’t need to leave until noon. I make sure the corn dryer is started and working properly before returning to the house to read and study. I check the dryer periodically throughout the morning. Everything seems to be working well. Then at noon, I put on my crisp, new, white uniform and drive away to my first attempt at being a real nurse. I am proud of my new look. It is six o’clock in the evening again before I am able to slip back into my barn clothes and start the milking. I try to keep an eye on the dryer while I milk, but it is time-consuming and tiring to keep running out of the parlor every half-hour. I am exhausted from the day and late already with the milking. Something doesn’t sound right as I get on my bike to pedal out for a delayed dryer check. As I approach, I notice that the dryer is almost empty. For some reason, the corn load auger did not start when it should have. This allowed the corn level to slide below the main drying chamber as it dried without refilling. The burner has gone out as a result of this. I do not need this. I tap the eye on the fill auger and it restarts, refilling the dryer with wet corn. After refiring the burner and getting everything back on track, I return to milking. An hour later, when I check again, the fill auger has failed to stop. A whole load of corn has spilled out over the end of the dryer. I cannot believe this. I cannot deal with this. I call for help from Paul.